SyncBreeze Enterprise provides the ability to periodically send PDF status reports to an E-Mail address. 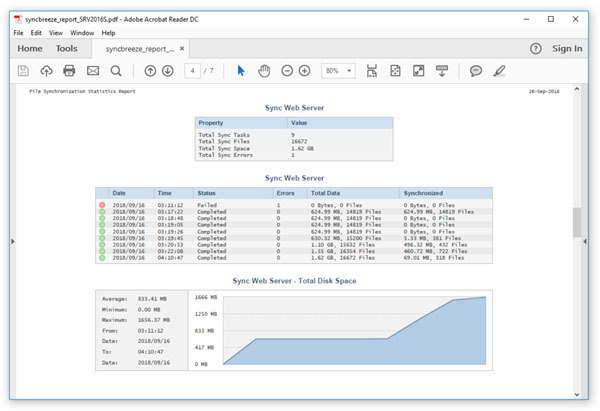 PDF status reports include the current status of all file synchronization commands, file synchronization statistics and a number of history line charts for X last file synchronization operations. 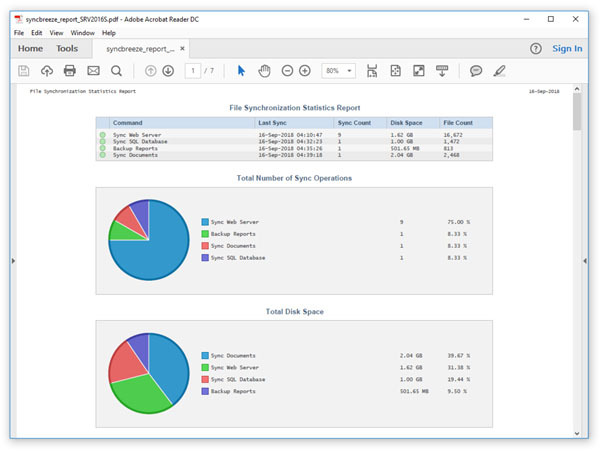 Each status E-Mail notification includes an HTML summary table showing the current status of all file synchronization commands and an attached PDF report with detailed information about all file synchronization commands, history statistics, pie charts and history line charts for X last file synchronization operations according to the configuration selected on the 'Advanced Server Options' page. In order to configure periodic status reports, open the 'Advanced Server Options' page, enable periodic status reports, select the time interval, enable E-Mail notifications and specify an E-Mail address to send status reports to. In addition, open the E-Mail server configuration page and specify an SMTP server to use to send E-Mail notifications.